After 12 months, the variable Regular APR, currently between 14.15% to 28.15%, will apply. This rate will vary with the market based on the prime rate. 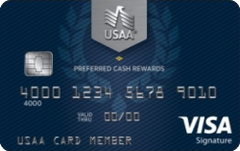 Our take: For cardholders with the best credit scores, the USAA Preferred Cash Rewards Visa Signature card combines decent hassle-free rewards with unusually affordable terms; however, cardholders with lower scores could get slapped with an excessively high interest rate.